Happy May Day! Do you give May baskets to anyone? When I was small and living in Oklahoma, I remember there were May Poles at one of the parks. Girls dressed in pretty dresses would walk around the pole wrapping it completely in colorful ribbons. I wonder if anyone still does that. My mother has been teaching piano for fifty years! She still has over ten students. Two of them happen to be our grandchildren--her great grandchildren. Last week she had her annual recital. They played on the most beautiful-sounding Steinway grand piano. My mother is a superb teacher and it is thrilling to see them getting such a wonderful start in piano with her. I saw this in the parking lot the other day. I'm pretty sure it belongs to the wife of a guy who owns a bunch of gyms here in Fresno. Her name is "Pinky." Is Starbucks jumping on the patchwork bandwagon? And these two quotes have become favorites of mine as well. What's been going on with you in the last week? 2. Please link directly back here. Congrats to your mom & grandkids on their recital! Thanks for the happiest people quote, I love it! The grandkids are getting so tall! How fun to see the generations play piano together. I have a similar favorite quote: Experiences buy you happiness, not things. I love the color palette on Starbucks spring coffee blend. Have you seen the funky nail art inspired by that packaging? Pretty cool! Your grandchildren are so blessed to have your mother as their piano teacher. It is a great experience for all of them. I love May Day! I wore pretty dress and wound the May Pole at Grand View School. We also made paper funnel baskets with fresh flowers and put them on the door knob, rang or knocked then ran to hide! What a happy memory today! Thanks for the spark! Beautiful and precious piano memories too! I love to hear tunes coming from the piano. So nice that gramma can teach the grandchildren. How sweet that your grandkids take lessons from their great-grandmother! I remember May Day because it was my grandma's birthday, and we always celebrated by taking her freshly picked spring flowers. I love May Day, I got a basket this morning w/cookies. I made some baskets and will hand them out this afternoon. Lovely pics of the piano players; that car is ace! 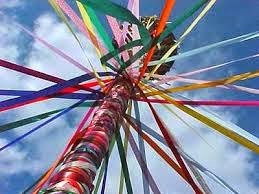 I loved watching May pole dances when I was little. I'd forgotten all about them. How wonderful that your grandchildren ant taught by their great grandmother. I really like the saying about being happy with what you have. Happy May Day! I've never given baskets for the occasion. Maybe I should start. I also noticed the patchwork at Starbucks. So glad you took a photo. Great quotes! When I see a pink car I usually think it belongs to a really good Mary Kay distributor who won the car! How fun to have two pianists already. I'm sure that your mom is thrilled!! I am all caught up!! How wonderful that your mother can teach your grandchildren the piano. So special.